After being out in the sun all day, playing in the water, laying on the docks, and having a few beers at the Boulder Res, I'm wiped. Past-me was smart enough to take a picture of my pre-water manicure for future-me though, so my manicure looks as new as the moment it was completed. Probably because this was taken the moment it was completed. I used Yellow Polka Dot Bikini (China Glaze) and Eutopia (L.A. Girl). I was loving this manicure, especially with my bright pink toes I had. I'll spare you toe pictures, because that's not what you're here for. Plus, after a day in the sun, in flip flops, they're less than appealing. Even the cold shower I tried to fool myself with couldn't take away the effects the heat left on my skin. Hopefully it's all just a beautifully, glowing base tan in the making. Yes. It's June. And I'm getting a base tan. Don't judge me. You're in Boulder! What a small world, I'm a few miles over. 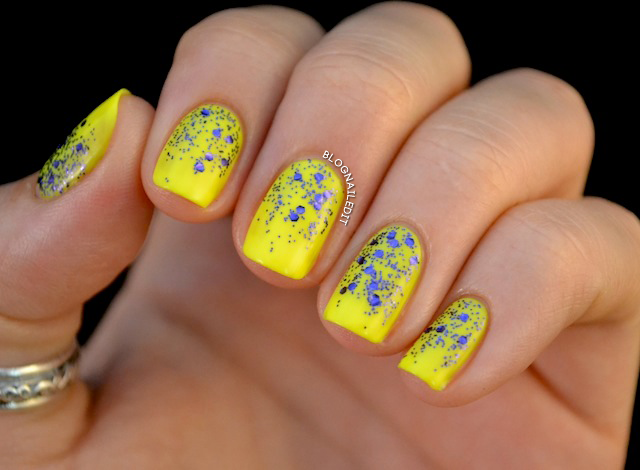 love the blue glitter with the neon yellow great combo! Love it! That is the best yellow manicure I've seen. I love the manicure! And also, I'd definitely enjoy seeing random toe manicures (I don't know the right word, is it pedicure?) every so often. But definitely more fingers than toes, obviously. Only when your toenails match your fingernails interestingly! Yellow Polka Dot Bikini is a great yellow!! This mani rocks! No judging for a base tan in late June :) It's better than August! I really like the yellow and blue colors together. This is very pretty! The yellow CG color you picked works great with your skin tone.